It's a Garden Party! Let us show you all the tips and tricks for this wonderful machine appliqué. Use the techniques I teach to make a pillow, table topper or make all 12 blocks to create an entire quilt! Learn foundation paper string piecing with Beads on a String. These beads can be addictive and the process is sure to make a dent in any scrap pile. The scrappy beads look rich and complex and the striped string adds a touch of whimsy. This is an excellent way to play with color. Gain a better understanding of how and why certain colors, shades, and tints play together with this hands-on textile workshop. Also learn to trust your gut with different print sizes in combination with color. Shannon is an architect and fabric artist with Moda Fabrics. You might think hexagons are tricky, but these half hexagons are chic, modern and super fun to make! Unbelievably easy Hexagons with no "Y" seams. Uses the Hex-n-more ruler (by Jaybird quilts) or the template provided in the pattern. You can never have too much fun with fabric! These cute, oval fabric "treats" are made from a jelly roll. 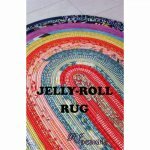 All it takes is one Jelly Roll, forty two 2.5" fabric strips, and 100% cotton batting to make this fun area rug. Unwrap a mystery with Linda Ballard! Normally when you choose a quilt project, you see the design of the quilt, just not in the colors and/or prints you plan to use. But when you choose a mystery quilt, the design is revealed only as you work on it. That?s the mystery! You know that whatever it is?it will be spectacular! Are you looking for a challenging project that incorporates a variety of high impact and low volume prints? Look no further than Cassandra Ireland Beaver?s ?Raise the Roof? quilt. This paper-pieced masterpiece was inspired by the rafters and oversized ceiling fans found in the Horticulture Building at the Ohio State Fair. What a cool inspiration source for this gorgeous quilt!